Learn two tricks. One will save you time and the other will give you the chance of making more money. Head over to Topcashback now to login or sign-up and get involved. It’s an Easter competition and there are lots of nice little prizes to be won. You can get anything from a teeny tiny £0.10 all the way up to a cool £1,000. In total there is 10 grand to be won between all the members! The competition will close on April 17th 2017 so if you are reading this page after that I’m afraid you’re too late for this one. However, they do hold these sorts of events throughout the year so it’s still worth checking their website. How do you take part and win? You will need a bit of lady luck to be a big winner (obviously). There are actions you can take to give yourself the maximum chance of picking up something. Each day you log in to Topcashback there will be a daily clue. If you visit the page that the clue represents then you can click on a hummingbird and you may win something. 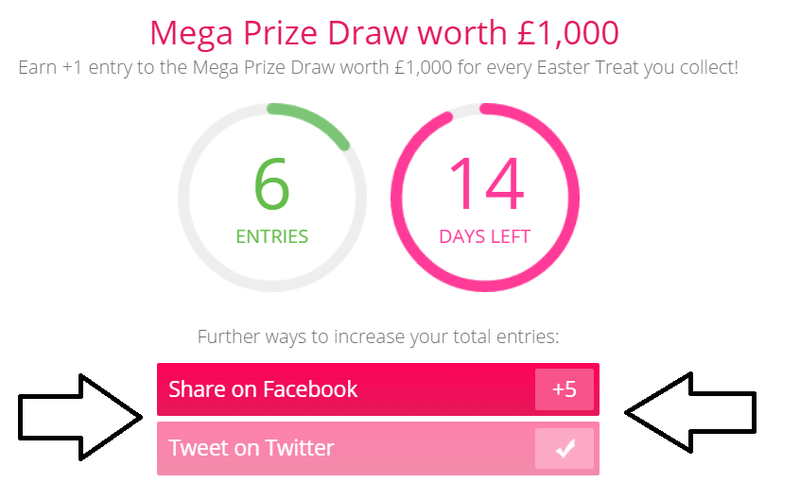 At the minimum, you get an extra entry to the mega draw. Be sure to log in every single day for the different daily clues. There is a nice little time saver you can do to make this easier. Here is a video I recorded after they ran the Christmas competition demonstrating how it’s done. It doesn’t really work if you login first thing in the morning though, the afternoon is best. Hopefully that cheeky trick can save you a bit of time each day. Want even more chance to profit from this? So the first tip was to be sure to login every single day and use my method above to save yourself time. Note that down and remember to do it! The second tip is to make sure you share the details of the competition on social media if you use Facebook and Twitter. But there is slight twist to my method! Doing it my way gives you an added benefit. To start with; login to Topcashback and go to the competition page to find the sharing links. This is how they look. What you do is click on each one to open up a page of the social media website. It will have some text and a link but you don’t have to use that! This is where the extra opportunity to get more money comes in. For a start write in your own text, something a bit more unique and try to make it appealing to your followers. Then remove their link and put in your own affiliate referral link. You can find that by going to the ‘Account’ section and then clicking on the ‘Tell-a-Friend’ option. I’ve just done mine and here’s how it looks. Once you’ve crafted your message send it out there. This way there is actually a total of 3 benefits! You get 5 bonus entries to the grand draw. You are helping your friends potentially win money too and sharing a great website with them. If they join through your link you will get extra money! Well worth doing for not much effort. That’s all there is to it. Those are my two top tips. Make an effort to login everyday to get every clue whilst using my small little hack to save time. On top of that share your referral link for bonus entries to the draw and the potential for bonus cash should you’re friends join in too. Whilst we are on the topic of cashback if you didn’t see my recent post then please also read about taking advantage of cashback bonuses to squeeze a bit of extra money for very little effort. That way if you are a winner you may be able to bump up your winnings by a few more percent! 100 ways to make extra money using your PC, laptop and smartphone! Casino cashback offers: how to make easy guaranteed profits in UK!